The National Museum of the United States Air Force is an icon of National Aviation Heritage and a repository of national treasures. According to its website, the museum is "the oldest and largest military aviation museum in the world." It is located at the Wright-Patterson Air Force Base, near Dayton, Ohio. Yes, that is the same location where the Wright brothers perfected their plane. You can actually plan an entire aviation week, encompassing nearby attractions related to the history of flight. I will write about some of these in later posts. The museum is free, and there is ample free parking. To say the museum is large is an understatement. It has over a million square feet, not including the outdoor Air Park and Memorial Garden. The galleries are formulated around historical events, so that the planes and artifacts themselves, tell a story of our nation's history in each major war. There is also a strong emphasis on the history of flight, innovation and space exploration, as these are also directly correlated to the history of the US Air Force. 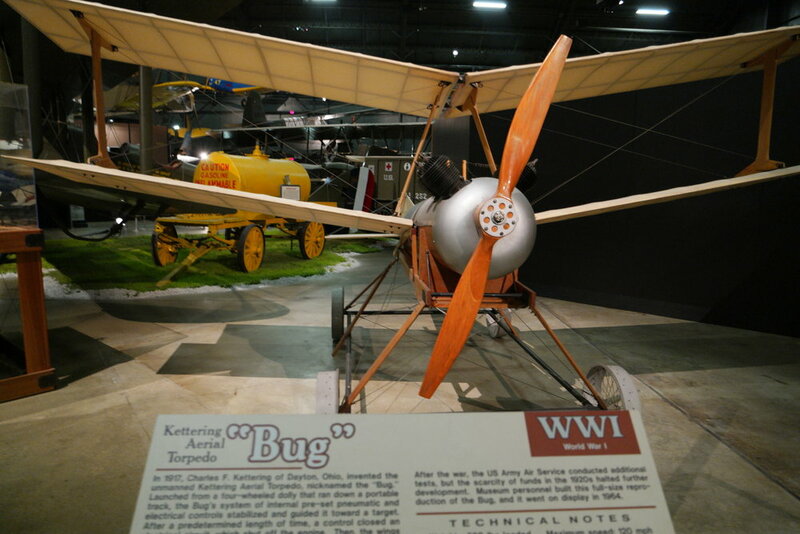 Each gallery is supported by historical information from the time period, such as newspaper articles, photos, films, related artifacts, and aviators' personal stories. Well-organized galleries in a series of connected hangers, tell the history of innovation relating to flight, such as those related to early flight, WWI, WWII, space exploration, and the Cold War. It is difficult to fully appreciate this museum in one day, due to its sheer size. Each gallery took us about 2-3 hours. If you have time, I would recommend arriving early, or splitting up your visit. If your time is limited, I recommend formulating a plan for your visit, so you don't miss anything you have in mind. The atmosphere at this museum is so welcoming, that you find yourself wanting to visit again. It is run by volunteers who are always eager to answer questions and say hello. One volunteer selling the souvenir photographs told me that some people actually spend an entire week to go through all of the collections. 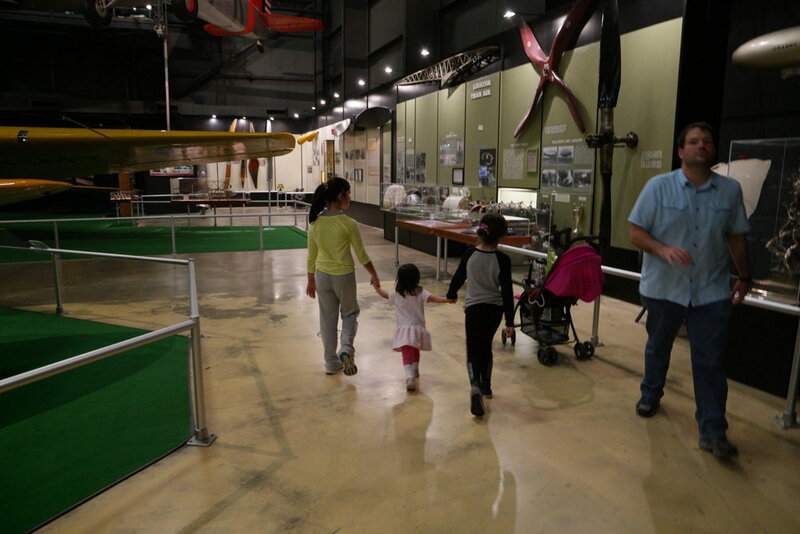 Guided tours are offered Free daily at 10 a.m. (Early Years and World War II Galleries), 11:30 a.m. (Korea, Southeast Asia, Cold War and Missile Galleries), 12 p.m. (Fourth Building), 1:30 p.m. (Early Years and WWII Galleries) and 3 p.m. (Fourth Building). There are kids scavengers hunts and activities on the kids section of their website . You can print these ahead of time. There are many diverse events through the year. An array of programs are available for schools and other educational organizations on the Education section, which includes a teacher guide for each gallery and lesson plans. As a teacher, I was impressed by the quality, organization, and alignment to historical learning of these materials. Parents may want to take advantage of these guides too, as they are excellent resources to read in the car or for Personal learning days or for STEM Homeschooling days. Click here to access the Resource guides. Destination Space Station • Nov. 19 Learn about the International Space Station and spaceflight from 9 a.m.-3 p.m., plus build your own space station from recycling materials. This museum left quite an impression on me, which was a bit surprising, considering I am not a huge plane fanatic. My husband served in the US Army, so I planned this trip for his birthday. I found myself enjoying it immensely. It is one of among the best museums I have ever been to around the world, for both its authenticity, quality, and historical integration using artifacts to explain key events in American and World history. As my daughter said, "It really feels like you can understand what it was like to be there." You feel like you are stepping into history, and in some cases you really are, as you can board many historic planes. The picture above shows our two older girls immersing themselves in an exhibit about the Berlin Airlift. The museum prompted my kids to ask historical questions. They were eager to go back after our first visit. I left feeling an immense respect for the contributions of our aviators to the history of our nation. It is evident that the curators of this museum have taken extensive care and attention to detail in compiling these collections. They continue to expand their collections today. It is important to note that many individuals contributed to the state of the museum today, working over several decades to conserve national treasures and artifacts important to the legacy of our nation. In their mission statement, the museum states their sense of responsibility to the history of the United States Air Force and American people stating, "We are the keepers of their stories." This mission comes across passionately. I've included a link to the history of the museum from the Air Force Museum Foundation for those interested in exploring these aspects. Our family decided to become members. As of November 14, 2016, the minimum starting donation is $30, which is tax-deductible, and provides a magazine subscription, a calendar and 20% off the museum store and cafes. If you plan to visit more than once or want to support their mission, it is worth asking about it on your way in. My daughter decided to buy an Air Force jacket at the Museum gift shop (pictured below) and some astronaut ice cream on the way out, so inquiring about membership early, would have been worthwhile. We ended up joining on our third visit. A new fourth building recently opened this summer, featuring Space & Global Reach, Research and Development, and Presidential galleries with more than 70 additional planes. You don't want to miss this gallery. Below is a slide show of some of the highlights. The new 40.8 million gallery includes several one- of-a kind, historical planes, such as the retired Air Force One, SAM 26000, VC-137C (Boeing 707) pictured above. 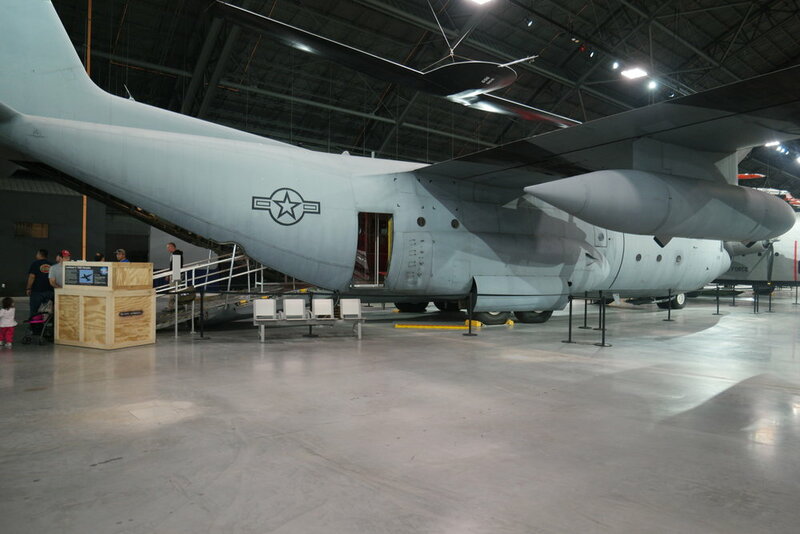 According to a 2013 article on CNN, a few years ago, this plane had been closed to the public, due to lack of funding for buses to the outdoor yard, so its recent reopening in the new, indoor gallery is very exciting. This plane saw many key events in American history; it is the same plane that transported JFK to the ill-fated trip to Dallas on November 22, 1963 and you can stand before the very spot on-board where Lyndon B. Johnson took the oath of the presidency following Kennedy's assassination. Boarding this plane, I felt a deep sense of history overcome my every sensation-the musty smell, the overwhelming feeling of sadness knowing it had transported JFK's remains and the sense of connection to history knowing it had been the workplace of all the presidents after Kennedy until 1998. In the same gallery, you will find two prior planes use to transport Presidents Eisenhower and Truman, which display Air Force insignia instead and have a very different look. The planes transporting Presidents changed during Kennedy's presidency, as Jaqueline Kennedy commissioned designer Raymond Loewy for an update. The plane became a symbolic extension of the White House in the air, proudly displaying the American flag and Presidential seal. This same aircraft took Nixon took to open relations with China and was later used by eight Presidents until 1998, the last being President Clinton( John King, National Museum of the United States Airforce, Aircraft Catalogue, 2015 edition, purchased at the museum gift shop). The new wing also includes a focus on STEM learning for kids, and a few virtual reality transporters. I will write about this wing a bit more in-depth in another posting, to do it justice. If you forget to bring a stroller, you will find a multitude of neat, little metal strollers on the wall near the bathroom, as well as wheelchairs and motorized scooters. I thought this was especially useful since the galleries are quite large. 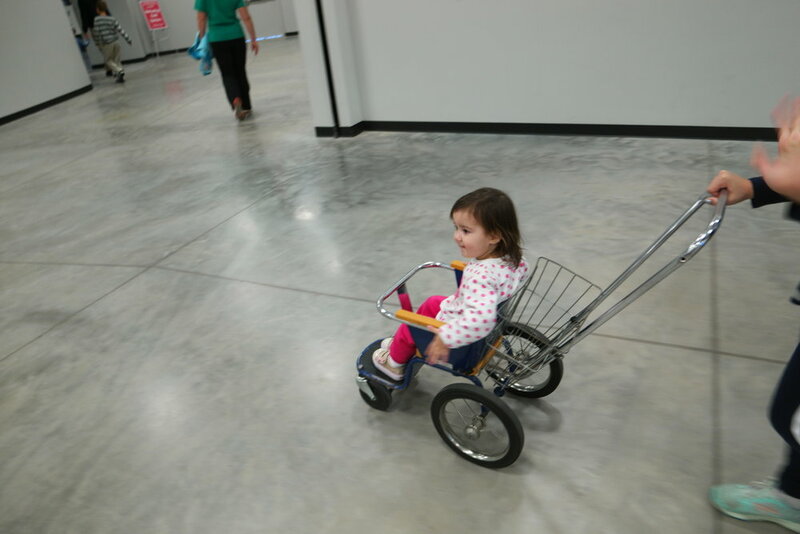 We brought our own stroller, but Emma wanted to take these metal ones for a spin. Taken together these galleries create a sense of emotional connection to the aviators and key events in their time period. Each exhibit adds to a historical sense of time and place, creating a reenactment of history. The authenticity of the items and their meticulous restorations and upkeep, add to the allure of the museum. In addition, the layout allows you to see how key events in history influenced one another, in relation to military history and world events. If you have school-aged kids, the museum has added technology portals in each wing where they can learn about events through photos and quiz-questions to test their learning as they go. I loved that they included historical content, such as newspapers announcing the start of WWI next to the planes, telling a chronological story. It is also enjoyable because the museum is laid out so that you can go as in-depth as you would like into each gallery. It has side galleries dedicated to more specific aspects, such as Disney's role in creating art for Aviator jackets. 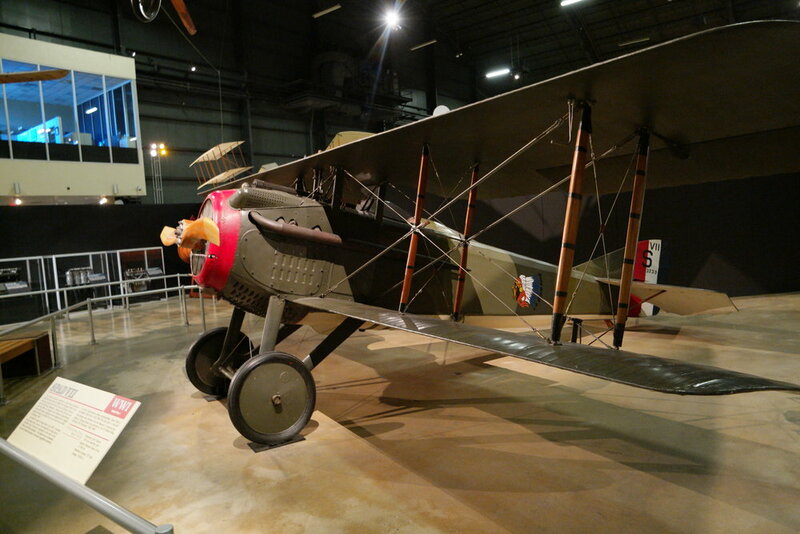 Artifacts like a bicycle sold by the wright brothers and jackets worn by Aces during WWI add personal stories, and tell the history of flight in their own right. I encourage you visit to this museum with your whole family; you will leave with a renewed sense of respect, awe, and admiration for the history of flight. Everyone will find something to enjoy. When we were at dinner, and I was asking everyone if they had fun on our day, and my two-year old raised her hand and said, "Me, Me, planes." 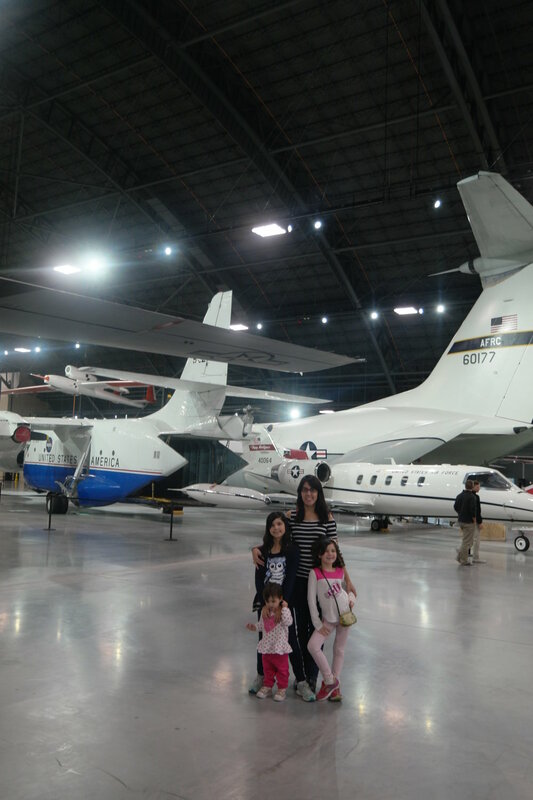 She enjoyed the ample room to walk around, the family flight simulator, and getting on the different planes. My older daughters left with a deeper appreciation of our nation's history. I have a science background, so exploring the spirit of innovation that drove so many later advancements, most impressed me. I especially enjoyed seeing the Apollo 15 Command Module on loan from Smithsonian, in the Research and Development Gallery. 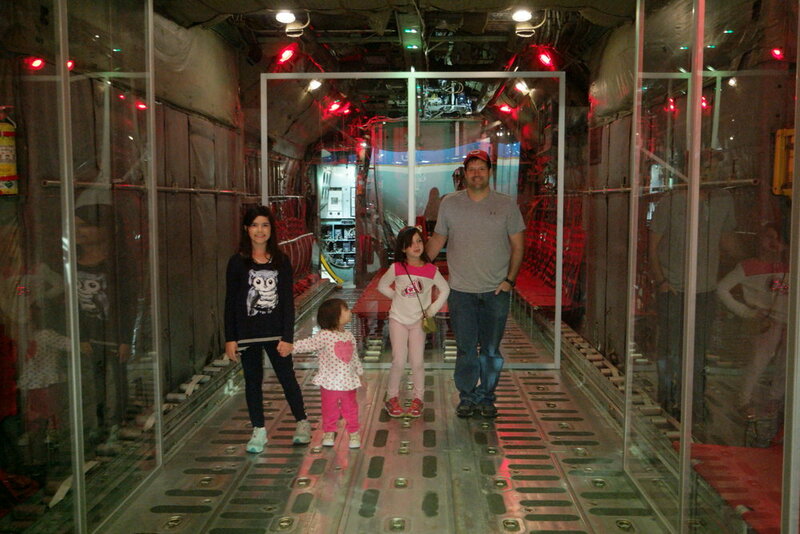 I enjoyed watching my husband explain to my daughters some of his own combat history, as they boarded a cargo plane used to transport soldiers. My daughters could actually board a C1-30, and he could explain some of his experiences.